Despite what you’re probably heard, your body is hungry for fat. Not just any fat, it needs rich, high-quality, unprocessed fats and oils to supply its requirements for energy, cell building and repair, and a healthy nervous system. Buy 3 to 5 bottles, get 5% off. Buy 6 or more, get 10% off! Recommended in the Weston A. Price Foundation’s 2012 Shopping Guide – Ranked in the BEST Category! PLEASE NOTE: The Manufacturer, Green Pasture, has recently changed their product labels whereby specific vitamin levels are no longer being reported. The vitamin information in the table below refers to what was previously depicted before the labels were changed. The Cod Liver Oil Debate. Batch processed through a proprietary fermentation technique similar to that of making apple cider vinegar. Some will like taking their oil with a little water or milk. We love the taste right off the spoon! Also works great as an addition to salad dressings or directly to salads. Now available in a variety of flavors in liquid, capsule or in a new Kid Tested flavors. Makes the perfect complement to X-Factor Gold Butter Oil. More and more people are discovering the value of supplementing their diet with high vitamin cod liver oil. This oil is a rich source of vitamins A and D, both of which are not easy to obtain optimal levels of in our modern diet and lifestyle. Increasing numbers of studies indicate that deficiency of vitamin D is incredibly common among Americans, and that the lack of this crucial nutrient may be related to a variety of health issues. Additionally, high vitamin cod liver oil is a good source of the essential fatty acids EPA and DHA, otherwise known as the “Omega 3s.” This oil is thick and rich, full of naturally occurring nutrients. This oil is regularly independently tested in small batches to international purity standards, so you can rest easy knowing that even with the most minimal processing of any cod liver oil, there is no compromise on purity. Many choices are available including a variety of flavors in liquids and capsules. Following is a brief description of each. *Please note:The addition of natural flavors is meant to enhance the taste experience. However cod liver oil taste remains prevalent. We cannot accept returns based on flavor preferences. 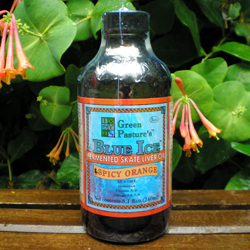 Flavor & Antioxidant Free Liquid – Simply pure cod liver oil and nothing else! Flavor free is a bit of a misnomer in that if you enjoy the taste of fish you will appreciate its fresh fish flavor. Like most fermented products, it produces a bit of a tingle in the back of the throat. Cinnamon Tingle Liquid – A favorite of many, the flavor has been improved with the use of organic cinnamon oil, organic stevia leaf, and a bit of cranberry seed oil as an antioxidant while the tingling sensation has been removed by the addition of an emulsifier (fermented hyaluronic acid). 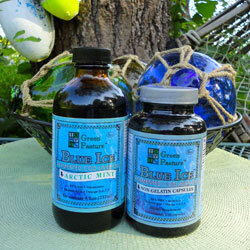 Arctic Mint Liquid – With its natural mint flavor, many find this cod liver oil a refreshing alternative. Oslo Orange Liquid – Includes organic orange oil, organic lemon oil, and a bit of cranberry seed oil as an antioxidant while the tingling sensation has been removed by the addition of an emulsifier (fermented hyaluronic acid). Non-Gelatin Capsules – For those who prefer to take their cod liver oil in capsule form, this is simply fermented cod liver oil, a bit of cranberry seed oil as an antioxidant and unbleached beeswax as a thickener. 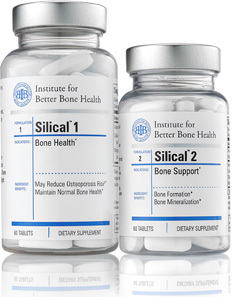 Capsules are made from plant cellulose. Non-Gelatin Capsules (Orange) – This is the same as our regular capsule with the addition of organic orange oil. Ginger Liquid – Kid Tested! – Includes natural ginger essential oil, organic apple pectin, purified water, cellulose, trehalose, vegetable glycerin and a bit of non-GMO sunflower lecithin as an emulsifier. Mix well before each use. Licorice Liquid – Kid Tested! – Includes natural anise essential oil, organic apple pectin, organic whole leaf stevia, purified water, cellulose, trehalose, vegetable glycerin and a bit of non-GMO sunflower lecithin as an emulsifier. Mix well before each use. Peppermint Liquid – Kid Tested! – Includes natural peppermint essential oil, organic apple pectin, organic whole leaf stevia, purified water, cellulose, trehalose, vegetable glycerin and a bit of non-GMO sunflower lecithin as an emulsifier. Mix well before each use. Research shows that butter oil and cod liver oil, taken together, provide complementary factors leading to proper essential fatty acid balance. High-vitamin butter oil contains arachidonic acid (AA), an omega-6 fatty acid, while cod liver oil is rich in eicosapentaenoic acid (EPA), an omega-3. Moreover, the saturated fatty acids in the butter oil promote efficient utilization of the unsaturated fatty acids in the cod liver oil. Finally, butter oil contains a broad and deep range of important quinones including Vitamin K, E and CoQ enzymes while cod liver oil is rich in Vitamin A and D.
Our High-Vitamin Butter Oil is extracted from dairy milk produced by Guernsey and Devon cows (high butterfat producers) that graze exclusively on irrigated grass in the northern Great Plains. This specific combination of climate and irrigation produces a rapidly growing specialized forage, ensuring optimal levels of Activator X as discovered by Dr. Price. Activator X and other nutrients are then further concentrated by putting the butterfat through a specialized low-temperature centrifuge process. Be the first to review “Fermented Cod Liver Oil” Click here to cancel reply.